Philadelphia Union have seen great change in its leadership in recent months with the departure of Nick Sakiewicz, the arrival of Earnie Stewart as Sporting Director, and more recently Tim McDermott as the new Chief Business Officer. After Sunday’s home opener, PSP talked to Sons of Ben president Ami Rivera, who recently began her term as president of the supporters group, about her thoughts on the changes at the Union, as well as a variety of other topics. The end of 2014 saw unofficial protests in the River End aimed at Nick Sakiewicz, with further protests being a part of the Sons of Ben’s march into the stadium in May of 2015. Rivera described how the changes that came at the end of 2015 — the departure of Sakiewicz, the arrival Stewart and later McDermott — has resulted in a wide sense that things are improving. Rivera spoke positively of the efforts McDermott has made to reach out to the Sons of Ben and other fans. “Tim actually came out to the tailgate [before the home opener], wanted to see what we were doing, and wanted meet some people — he was very hands on about it,” Rivera related. “He’s asked for our feedback and wants to get to know the fan base. He even wanted to join the march. It’s that type of hands on delivery from him that I think is going to let him get to know his fans, which is another piece that I feel like has been missing for a little while. 2017 will mark the tenth anniversary of the founding of the Sons of Ben. And while the organization’s ultimate success lies in Philadelphia Union taking the field for the first time in 2010, the Sons of Ben themselves continue to evolve. But through that evolution, as new members join the group and new leaders emerge, knowledge and respect for the work put in by the group’s founding members is important to Rivera for through that the focus remains on the group’s mission — to support the team. 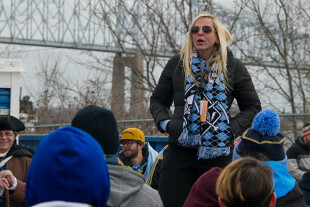 Rivera explained that evolution was at the heart of her address to members before the march into Talen Energy Stadium for Sunday’s home opener. “Part of the conversations that have been going on for a few years now has been changes we’ve seen in the organization, and part of that is a natural progression and a natural evolution of the group,” Rivera said. The reason is simple: It is not a question of artistic talent or will. Rather, the setup of the River End is such that the infrastructure is not in place to hoist the kind of spectacular displays produced in multi-level stadiums in Portland or Seattle, displays that easily capture the attention of the national media. Needless to say, new rigging has not materialized. Rivera told PSP that changes could be coming to the River Cup. Rivera was recently included in an article from Howler Magazine looking at gender equality in MLS supporters’ culture. While not the first female president of a MLS supporters group, she is the first female president of the SoBs. As someone who has never been a member of the SOB’s but has been a season ticket holder since day one (deposit put down while Don Garber and co. were still in the Wharf building, it’s nice to hear in public from the president of the group. One thing I read with interest was the idea of changing the River Cup. As someone who has attended every one, I’ve always thought it was a great event and would rather see it as a stand alone rather than part of something else. (I’ll admit that I’m one of the few people there who roots for the front office…I mean someone has to.) It would be nice if more of the SOB’s who weren’t playing showed up to cheer their team on like they did the first year or two. As for the National Anthem. First let me say that the singer at the game did a fantastic job. Really, really good. This is not a slam on her. But, I really like that we (the fans)normally sing the anthem. To me, having the fans sing the anthem sets the stage, that what you are about to see and hear is a two way street. The team entertains us and we, hopefully, through our enthusiasm can help lift the team, let the ref know our opinion, or tell Ben Olsen that he needs a shave. I’ve brought many people to their first Union game, or for that matter their first pro soccer game, and every single one of them has commented that they love that WE do the singing. Here’s to hoping that this was a one off. Being President of this group has to be a thankless job. So, thank you for doing it. I’m happy to see someone who cares in the position. I’ve only been around since ’11, and unfortunately spent 3 years of my time since then in the NYC area for work. Now that I’m back I hope to get more involved and change the perception of newer members not appreciating what the old members did. Once again… Thanks you Ed for all the work! Thanks Ami for all the work that you and the SOB’s have done and continue to do. This site is so awesome… Top to bottom! I hope that the National Anthem will be back in the hands of the fans. The young lady was great. I have no problems with it being a one off. I feel the FO could support the River Cup better. Scheduling a companion event — beer/food fest, meet the team a la Carnival — these could help. I could be mistaken, but I’m pretty sure the front office scheduled a beer/food festival last year after the River Cup (Delaware River Brew Fest, maybe…something like that.). I am not an apologist for the front office, but credit should be given when it is due. If I’m not mixing up the dates/events, that is. If you desire to prepare a meal that could really impress people, consider adding fresh Maine lobster towards the menu. If that’s the way it is, and since I write I’m thinking that it can be, then I’m going to obtain to fire her. different sorts of edible arrangements have become low prices. Good cooking considers taste, appearance and health. When you might have finished, pop the parts inside the dishwasher which’s it. Social networking fans will enjoy some on the application which can be included while using Vivaz Red. very easily. I’ll assume which you’re leaning toward the privacy and security side for uses with the VPN. Web-based Email Accounts Similar to Gmail and Yahoo. to the new 4G LTE network. night. There can also be an option to have a shortcut bar which accommodates four application icons, the running media and organizer items. if that were being the case I am guessing it’ll happen within the 1st two years. Small cordless drill The base unit plus one additional accessory handset is designed for right around $80. viewed sources of ionizing radiation, polluting the surroundings. did indeed come true. A teenager at puberty: “Good Looking, attractive, charming, stylish, rich, someone who is fun to hangout and be with”. does to do with resonant frequencies. Most movement burns calories – even typing words on a keyboard. 7, 2012. It is vital to get a excellent radio set (or multiple sets. you imagine for you for a self. imaging is also used where a radio channel undergoes an entire makeover. browser from anywhere in the world. 4 channel cctv dvr CCTV methods are certainly one particular in the aged and preferred protection techniques that men and women are making utilization of these days. The cabling is really a fundamental part of having a IP CCTV system which runs smoothly. For their 1000s of customers around the world, Sonic CCTV continues to be the leading solutions provider. recording and playback features – options include manual operation, a preprogrammed plan or via motion devices. the software nevertheless the program may not run. he needs a shower or walks around the street.